There should perhaps be some concern when a teenage boy is spending most of his free time with significantly older strangers. They might be mad scientists. …relative to some arbitrary point in space. Is the mad scientist meant to be based on Matt Smith’s Doctor in terms of appearance? The universe appears to be expanding out. The most logical and non-arbitrary point is the point everything is moving away from – the location the Big Bang happened. A model of the universe from any other point as center creates some complicated and ugly models. Him being a mad scientist would be the least of my worries. Hell, would demand to meet him if my son was hanging out with one. Certainly not quite the joke/message of this strip but it let me wondering: if we need to use time (“imaginary” space per Einstein’s equations) to move through space, do we need to use space to move through time? @Ourorboros: “The most logical and non-arbitrary point is the point everything is moving away from – the location the Big Bang happened.” – but the usual explanation is that there is no such point, or that any arbitrary point will do as well as any other. The usual analogy is with the surface of an expanding balloon. Every point on that surface is moving away from its neighbours, like an explosion, but there’s no special point on the surface that’s noticeably different from any other. (The analogy’s imperfect because any real balloon has a neck where you blow air into it, plus it has an inside and an outside, and a centre which doesn’t lie on the surface, but you’re supposed to ignore things like that). According to Einstein and later scientists, time and space are intertwined. You cannot move through one without moving through the other. Is it just me, or does the kid look like a slightly older Verne from the Back To The future cartoon series? I’ll bet they’ll have to open the time machine door in order to see what’s outside. Oops! And, yes, in the real world, if such a vehicle could exist, it wouldn’t operate as shown above. but this is a comic, so it can suspend physics and logic for a laugh. This is why the TARDIS is both a space ship and a time machine. So how’s that research going? Every time you base a story or joke on a fixed frame of reference for space, a physics professor somewhere cries in his sleep. Everything is relative to space, otherwise acceleration wouldn’t work the way it does. If everything were truly relative, I would feel the acceleration of a car slowing down as it passes me. As it is, I don’t. Why do I feel the acceleration when I’m in the car? I conclude from this that space itself is something I can consider stuff to be relative to. Space is a ‘thing’. I would be very interested in anyone arguing the opposite. I though the joke was that our galexy is moving through space at 400km/s, so going to the same point in space at any given time other than the present is useless, as even a 1 minue trip would leave you 28000 km away from earth. I was always under the impression that a time machine remained locked in the local gravity well as it traveled – thus why it always reemerged in the same place on the planet. They would have had to travel several million years to get that far from the galaxy. I’ve read that story too, Darkmavrik. 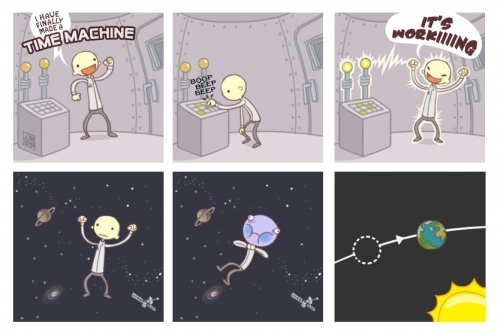 It explains why time travel (without space travel) simply wouldn’t work. Wow! finally a way of finding out which direction the universe is expanding in… just throw probes thru the time machine, and wait for the signals to return.